1410 48th Ave North Ext. If you are looking for the luxury of living on a golf course and the convenience of a central location, look no further. Myrtlewood Villas condos have it all. With 1-2-3 bedroom floor plans, these villas are the perfect place to call home or make ideal rental properties. For members and owners registered in the rental program, a new fitness center and pool have just been completed and they now enjoy an outdoor pool, indoor pool, a number of kiddie pools, Jacuzzis, lazy river and an adult fitness center. Myrtlewood is only a few blocks from Broadway on the Beach and the most exquisite dining in Myrtle Beach. A short golf cart ride to the beach, it is still conveniently close to Myrtle Beach Airport. Not to mention close proximity to the Myrtlewood Golf Course and many of Myrtle Beach’s 100+ championship golf courses. Within Myrtlewood are 3 unique condo communities: Magnolia North, Magnolia Place, and Magnolia Pointe. Built separately, each has its own amenities and extras but all three border the renowned Myrtlewood Golf Course. Magnolia Place is the original condo neighborhood and is notable for their ‘weeping mortar’ brick exteriors, with 102 bedroom units that are priced under$100k. Magnolia North is the second development and these condos have Hardi-Plank siding. Many of these condos have single car garages. 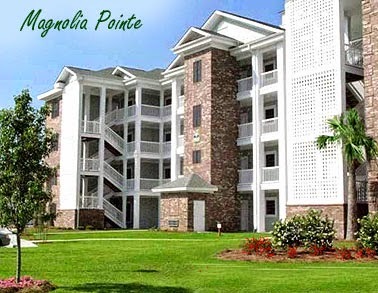 The 1-2 bedrooms condos are priced from $100-150 K.
Magnolia Pointe is the newest addition to Myrtlewood and there are brand new condos available. The most fashionable of the 3 communities, it has garages and elevators. These units feature 2-3 bedroom condos priced from $15- $200+k. All three communities offer you the best of a Myrtle Beach golf course condo lifestyle. Let us show you the condos for sale in Myrtlewood Villas today.